MOSCOW (Sputnik) - The Russian Olympic Committee has already been punished for the alleged state-run doping program in the country, President of International Olympic Committee Thomas Bach said on Tuesday. "In PyeongChang, we sanctioned the systematic manipulation of the anti-doping system in Russia during the Olympic Winter Games Sochi 2014. The IOC sanctioned those entities involved, proportional to their levels of responsibility … With its suspension from the Olympic Winter Games PyeongChang 2018, the Russian Olympic Committee has served its sanction," Bach said, as quoted in a statement. The Russian anti-doping system is being reformed amid the scandal over the alleged state-run doping program in the country, which resulted in a number of sanctions against Russian officials and athletes. Russian officials have refuted the allegations of the state-run doping program, while admitting that Russian sports had some issues with doping abuse. Earlier in the day, WADA stated that Russia had not provided the World Anti-Doping Agency (WADA) with data of the Moscow anti-doping laboratory by December 31, which was set as a deadline. "The 31 December 2018 deadline – by which time the Russian authorities had to provide access to the data – has elapsed without the data having been retrieved. The deadline was one of two conditions stipulated in WADA’s 20 September Executive Committee (ExCo) decision regarding the Russian Anti-Doping Agency’s (RUSADA’s) compliance with the World Anti-Doping Code (Code)," the statement said. 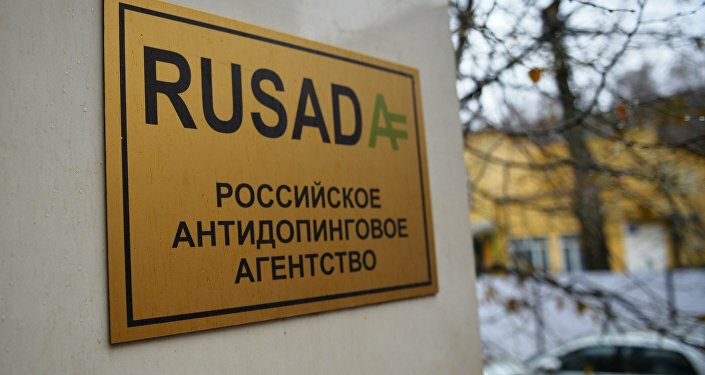 WADA pointed out that in mid-January the Compliance Review Committee (CRC) would present recommendations to the WADA Executive Committee on the status of RUSADA. "On 14-15 January 2019, the CRC will meet and review all available elements. The CRC will provide a recommendation to the WADA Executive Committee based on the applicable rules, namely the International Standard for Code Compliance by Signatories (ISCCS), which entered into force on 1 April 2018, and the Code; and as soon as practicable thereafter, the CRC’s recommendation will be considered by the ExCo," the statement added. This comes after, on December 21, a WADA mission, led by independent expert Jose Antonio Pascual, finished its visit to Moscow. The mission was tasked with retrieving raw data from the information management system of the Moscow laboratory, but has not managed to complete the task in time. On September 20, the great majority of the WADA Executive Committee voted to reinstate RUSADA as an organization that complies with the World Anti-Doping Code, with the head of WADA specifying that the country had met 29 out of 31 criteria included in the roadmap for reinstatement. The deadline for the two remaining criteria was therefore rescheduled for December 31.